We should be grateful for Obama's diplomatic gaucherie and lack of moral clarity, because it provides the rest of us with an opportunity to set a few things straight. President Obama shocked America’s many Israel supporters last week when he declared that not only must Israel “act boldly (read: unilaterally) to advance a lasting peace," but that “the borders of Israel and Palestine should be based on the 1967 lines.” But really, we should be grateful for our president’s diplomatic gaucherie and lack of moral clarity, because it provides the rest of us with an opportunity to set a few things straight. Should Israel set the tone for peace negotiations by making unilateral concessions as a sign of good faith? After all, it worked so well in Gaza! Right now, the Palestinian Authority is run by two factions: Fatah and Hamas. Both are known for launching terror attacks on Israeli civilians. Both would rather see a Palestine that is Judenrein. The only notable difference in how these groups relate to Israel is that Hamas is more or less up front about their genocidal intent (though they are learning). Fatah lionizes terrorists in Arabic while condemning violence in English. Hamas just straight up loves terrorism – it’s the main tool in their political toolkit (the others being dissimulation and repression). It’s fitting: while “Hamas” is an acronym in Arabic (for “Islamic Resistance Movement,”) the word “Hamas” in Biblical Hebrew actually means “violence.” In fact, in the book of Genesis, G-d decides to flood the earth, erasing all of humanity save for Noah and his family, precisely because the earth was “full of Hamas.” In Judaism, it’s axiomatic that there is no such thing as coincidence. As the Israeli withdrawal from Gaza illustrated (when Palestinians used the newly “liberated” areas as another launch pad for terror attacks against Israel), forced one-sided gestures—“acting boldly” to use the president’s expression— doesn’t advance a lasting peace. Quite the opposite: unilateral concessions only serve to embolden Israel’s enemies. It teaches them that terrorism works. So, why stop? Since President Obama is now in agreement with Israel’s enemies that Israel needs to withdraw to the pre-’67 borders, let’s talk about ’67. The war of 1967, also known as the Six-Day War (presumably because the Israelis had rented their tanks and aircraft for a week, and if they didn’t win the war and return their equipment by day seven, they would have lost their deposit) was fought when the countries of Egypt, Jordan, Syria, Iraq, Kuwait, Saudi Arabia, Sudan, and Algeria decided that the world would be much better off if Israel and its Jewish citizens just disappeared. The popular Palestinian sentiment at the time was that the invading armies should “throw the Jews into the sea,” a statement originally attributed to Palestine Liberation Organization Spokesman Ahmad al-Shukeiri, lately contested, yet often paraphrased by Hamas and their sympathizers up to today. Let’s make something clear: War, as a general rule, is bad. In war, bad things happen. Death and destruction on a mass scale may make for great entertainment on the big screen, but in real life, no sane human being wants that. When one party (in this case a broad cross-section of the Arab world, including the PLO) starts a war and loses (property, territory, etc.) to the country they attacked, the aggressor does not have the moral right to reclaim what they lost due to their own belligerence. War is supposed to have consequences – that’s what you call a deterrent. Seriously, how hard is this to understand? Any future Palestinian State must be founded on a comprehensive peace agreement with Israel. And while, as part of negotiations, some restructuring of the border situation is more or less inevitable, let’s not kid ourselves: The Israelis don’t owe it to the Palestinians to surrender what came into their hands via some kind of divine karma (there’s no way the Israeli victory makes any sense when viewed strategically; the Israelis were surrounded on all sides, not to mention vastly outmanned and outgunned). Lastly, as long as we’re setting the record straight, let’s look at the “Palestinian refugee problem.” We don’t even need to go into the fact that Israel’s Arab neighbors let the refugee situation fester in camps within their own borders, and if they had any interest in the Palestinians as anything other than a prod with which to jab Israel, they could pitch in and alleviate the Palestinian’s plight. No, the problem is simpler than that. Did you know that the United Nations has a special definition for Palestinian “refugees” that distinguishes them from any other kind of refugee? That’s why the number of Palestinian refugees has increased over the decades (from 711,000 in 1948 to 4.6 million as of 2008,) whereas in any other historical scenario, refugee populations gradually decrease. A refugee is someone who is forced from their home and, usually, is either expelled from their country of origin, or leaves to escape persecution. Their future children are typically the citizens or subjects of the countries into which they are born, and the refugee status disappears within a generation. But the United Nations Relief and Works Agency expands the meaning of refugee for Palestinian Arabs, to include anyone with at least one parent identifying as a Palestinian refugee, regardless of their place of residence! To bring a real life example, I once worked in an office where one of my colleagues was a woman of Arab descent. One of her parents was Canadian, the other Palestinian; a refugee, though it was unclear whether it was her parent who lived in British Mandatory Palestine, or her grandparent(s). This young lady was born and raised in Canada. She spoke English. She lived and worked in the United States. 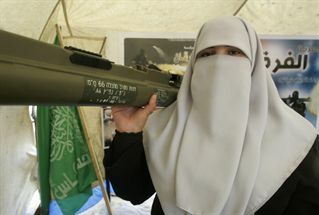 Yet, according to the UNRWA, she is a Palestinian refugee. And moreover, if she marries an American citizen and has children, they will be Palestinian refugees too (despite being born to a mother from Canada and a father from the United States). Anything becomes possible when you arbitrarily redefine words. Let’s take the above double standard and apply it to Israelis. Setting aside the relatively small percentage of voluntary olim (immigrants to Israel) from developed nations, the vast majority of Israeli citizens today are the descendants of people who fled the tyranny of the Czar, or communist oppression, or who, in the case of Israel’s Sephardic population, were forced out of Muslim lands after Israel declared independence; that’s why most of the Arab world today is, practically speaking, Jew-free. Jews had been living in these countries for centuries (generally under less oppressive rule than their cousins in Christian Europe), and only in the last century were expelled. That’s why you have groups like JIMENA (Jews Indigenous to the Middle East and North Africa), trying to bring attention to the Israeli refugee problem. In other words, if you define Jewish “refugees” by the same bizarre criteria used to define Palestinian ones, Israel becomes a country of refugees amidst a sea of hostility, whereas the Palestinians are a group of refugees surrounded by Arab states who supposedly seek their well-being. Of course, in the end, the Jewish refugee problem is not a problem. Jews are used to being kicked around. They pick up the pieces, and starting again from nothing, rise to prominence wherever they find themselves by virtue of sheer grit, determination, optimism, and, some of us would argue, divine assistance. Perhaps this is the reason for the phenomenon of American philo-Semitism, or why, as Congressman Eric Cantor so aptly put it at this week’s AIPAC Policy Conference, so many Americans identify with Israelis on a “gut” level. Jews, Americans, and American Jews, know what it means to work hard,starting from scratch and building something meaningful. They know what it means to put their faith in something greater than themselves. Once the Palestinians decide, in earnest, that tearing things down isn’t getting them anywhere, and perhaps it’s better to build than to destroy, only then will we witness an end to the Arab-Israeli conflict.